I want to creat a new mailbox for a new user. But i get the following error: The exchange server address list service failed to respond. 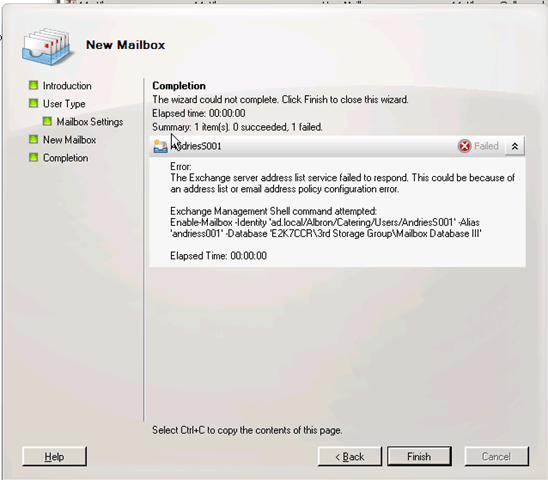 After that restart the Microsoft Exchange System Attendant services on the mailbox server. Forwards directory lookups to a global catalog server for legacy Outlook clients, generates e-mail addresses and offline address books, updates free/busy information for legacy clients, and maintains permissions and group memberships for the server. If this service is disabled, any services that explicitly depend on it will fail to start.